The hunger for authenticity guides us throughout our lives. People strive for joined-up living, where on the one hand what they say and do reflects what they think and feel, and on the other what they think and feel reflects who they are. Stephen Joseph has pioneered developments in research into authenticity, drawing on the solid science of positive psychology to develop what has become one of the gold-standard tests for assessing authenticity. His and others’ findings reveal that when people are in relationships in which they feel accepted, understood and valued, they drop their defences. They naturally begin to examine themselves psychologically, accommodate new information and live more authentically. What’s more, the latest studies reveal that it is authenticity that leads to true happiness. 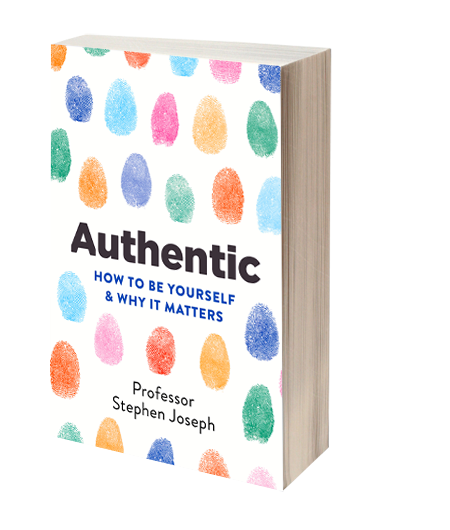 In Authentic, Stephen Joseph presents his fresh and inspiring perspective on the psychology of authenticity alongside practical advice and exercises for the reader. Drawing on the wisdom of existential philosophers, the insights and research of psychologists, and case studies from his own and others’ clinical experiences, he shows how authenticity is the foundation of human flourishing – as well as how the ideas relate to debates about the importance of happiness.